One of my favorite places to view birds is the Alligator Farm in St. Augustine, Florida. An alligator farm, you say, for viewing birds? Yes, wading birds of different species come there to nest for the safety of their young. You see, the alligators protect their young from tree climbing predators, such as raccoons. There is a very nice boardwalk that puts you at tree level with the birds, giving you a great advantage for photographing them. I’m not sure there is any other place where you can get this close to the birds and still be viewing them in a natural habitat. They start arriving in February, starting with the Great Egret and are followed by Wood Storks, Roseate Spoonbills, Snowy Egrets, Cattle Egrets, Tricolored Herons, Little Blue Herons and Green Herons. By July, fledglings are everywhere. Mid-March through July are prime time for viewing. We were there April 1st this year. There were lots of Wood Storks in the tops of the trees, and just a few Tricolored Herons and Cattle Egrets were on the scene. The birds are dressed out in their mating plumage and colors, looking their best in order to attract a mate. The Great Egrets are magnificent with their plumage and bright green color by their eyes. There was plenty of displaying going on, many were sitting on nests, and I saw one set of very young triplets. The mating dance of the Great Egret. I think the Great Egret has the best display of their plumage and seem to just love showing it off. Great Egret tending its nest and the only set of chicks I saw. The Snowy Egret is highly conspicuous and vocal in their sexual displays. They have plumage on their backs and heads. Their eye patch sometimes turns reddish as well as their feet, which is usually yellow. The Roseate Spoonbills have always been one of my favorite birds. Probably because of their beautiful pink color and unusual beak and the fact that it is not that common to see them. There were plenty to be seen at the rookery, but it was a little early yet for their young. In the past I have viewed the entire park, seeing all the gators and exotic birds they have. This trip I only spent time in the rookery. They also have a zip line, which I have heard was very good. Please allow a good bit of the day to view everything and to attend their shows. You can spend hours in the rookery alone, I know I do. I just can’t leave you without baby pictures, so to give you a taste of what can be seen in the month of May, I am posting pictures from 2011. Enjoy. Great Egret feeding her young. Oh, A Fishing We Will Go! February was a great month in the Keys, in spite of having some cold weather. I know, I know, it certainly wasn’t the cold everyone north of us was experiencing, but it was cold for the Keys. We awakened one morning to forty-eight degrees and a couple of other mornings in the low fifties! Good thing that didn’t last too many days or the drop in water temperature would start killing the fish. That happened four or five years ago. A lot of tropical fish died and a lot of manatees also. John and I have become quite experienced in fishing in the Atlantic. We were able to venture out in the ocean a dozen times during the month of February. We had some great catches of Hogfish and some poor catches. We were lucky enough to have our friend Gary to give us a daily ocean report. Gary goes in the Atlantic almost everyday and calls us to let us know how rough it is. He left a few days ago to head back home. Gary, come back! We took our friend, Pam, fishing a couple of days. Her husband had injured his finger, had to have stitches and couldn’t fish for a few days. Pam turned out to be the “Hog Queen,” because she out fished John and me. One day, John couldn’t catch a Hogfish for nothing, and Pam even traded places in the boat with him. He still didn’t pull in any Hogfish and Pam caught one right away where he had been fishing. John was sure catching all these pretty tropical fishes though. There is one fish that John and I just hate to catch. I think he is in the Boxfish family. He doesn’t fight coming up, and it feels like you are reeling in a really big fish. Nope, it is this triangle shape fish that has a very dense body. We nicknamed him Sponge Bob. This one is a Parrotfish. 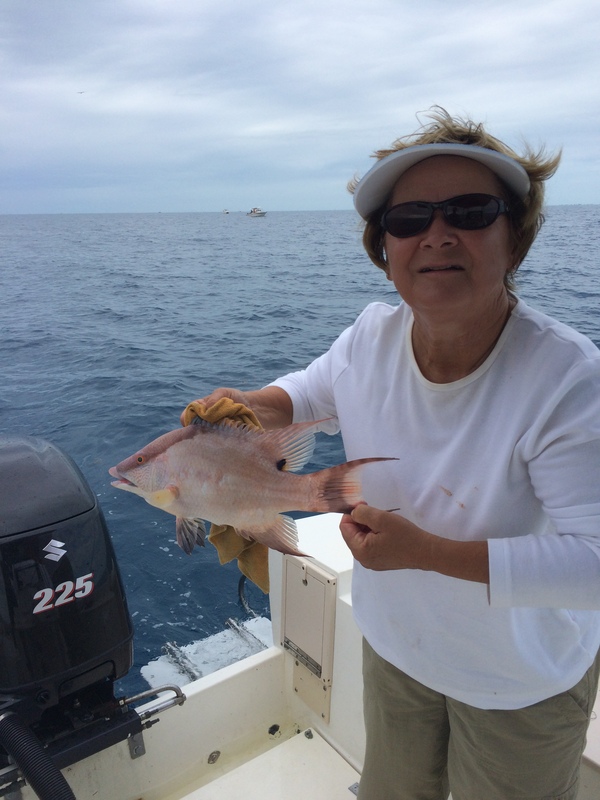 Pam with two of her largest Hogfish. A sunny day, mimosa, good friends and Snapper make for a fun day in the Gulf. It started out slow, but who cares when you are having fun. After having no luck on the first couple of holes, I suggested we try a hole we had not fished on this winter. Sometimes, I just know how to pick them and the girls ruled that day. Louise and I caught the most and the largest Snapper. I think the guys had the most fun watching us. After returning to Jolly Roger, the guys cleaned the fish and then we had a wonderful dinner of fresh fish. Denis and Louise, friends from Canada, brought mimosa! On one of our great days on the Atlantic, where we limited out on Hogfish, I also caught four really nice Porgies. They ranged from 16″ to 18 1/2″. Porgies give you a good fight, and when you are fishing in 90′ of water, it can be a real struggle to bring up one that large. It was really wearing out my arms. When I hooked up another large Porgy, at least that’s what I though it was, I knew from the start I couldn’t handle it. John took over for me, and he was struggling with it also. When it reached the surface, it was a four-foot ell! I had snagged it. We didn’t even take it out of the water, got the hook out and down it went. Good riddance. John bringing up a fish for me. Not a fish, but an ell! It’s not just fishing though. We do other fun things as well. The campground hosted a Mardi Gras Parade. It’s a short one, but is growing every year. Mike and Iris joined us for the parade. What did you have to do for those beads, Sammy? The campground hosts a cookout twice a month. Here is one of the fish frys. The fish is donated and cooked by some of the campers here. Everyone brings a dish to share. There is always a huge turnout and lots of great food. Everyone starts reserving their table early in the day. The cooks work hard, but they have fun while doing it. This year a lady has been leading a wine and paint class. She provides all the materials, paint and wine. The cost is $15 and you can choose to paint a wine glass, lobster buoy, or the end of a palm frond. The first two times, I painted a lobster buoy. This week, I painted a palm frond. I am no artist, but it was a lot of fun meeting new people and I thought my artwork didn’t turn out half bad. My palm frond that I painted as a dolphin. John went to the nautical flea market on Islamorada, looking for a new rod and reel and other stuff. He found one and was pretty pleased with it. One day out in the Atlantic, I was having a miserable time. John was catching fish, but I was just getting cleaned. I wasn’t even feeling them bite most of the time. After awhile, John suggested I try his new rod and reel. It was shorter and lighter, and he thought I might be able to feel the fish bite better. What a difference! Not only could I feel them biting, I was catching them! Some time later, I turned and said to John, thanks for the new rod and reel, you are not getting it back. Some cool things happened while we were fishing in the Atlantic. One day a pod of a dozen or more dolphins swam close by. I had never seen that large of a pod before. We’ve seen a lot of sea turtles, but one day a turtle kept hanging around near by. All through the day, he would stick his head up and look at us, like he was telling us, hey, you guys need to move on, you are in my spot. I can’t count how many days two jets buzzed us. They would fly low, right over our boat and turn sideways. It was the coolest thing and gave me such a rush. March has been a time for lots of good byes. Many of our friends have already left. We miss them, but we still have some friends here. To date our total for Hogfish we brought back is 96, Mangrove Snappers – 67, Yellowtail Snapper – 31, Porgy – 44, Mutton Snapper – 1, Mackerel – 2 and Cero Mackerel – 1. That is the total of the ones we brought back. We released many more. Our freezer is full, we gave a lot of the fish away, and we’ve eaten lots of fish. We bake, saute, grill, fry, and stew it. I have tried some new recipes that have been pretty good. The fish stew I made tonight was outstanding. It sure was a lot of work though. 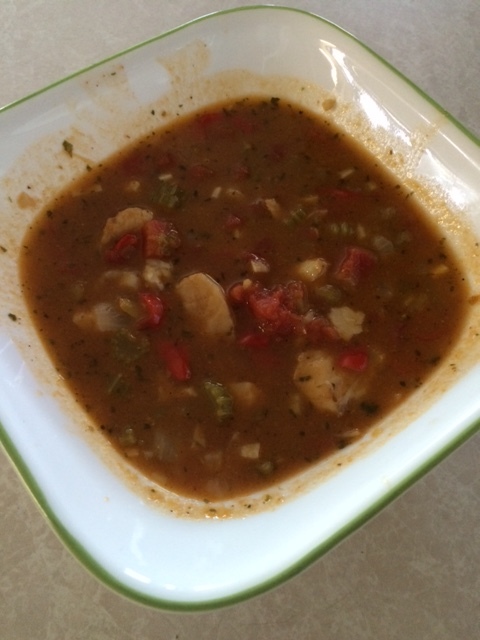 I made my own fish stock and even made a roux. Next week, my brother, Mike, and his wife, Terri, will be here. John and Mike will be going fishing and Terri and I will be doing fun things on the different Keys. Then our time will be almost up. We plan on being home the first week in April. It will be sad to leave the Keys, but it will be great to get back on Tybee to see our friends. Won’t be home for long though, we will be flying to California the second week of April! One last picture. Me and my 28″ Cero Mackerel. John and I have done quite a bit of fishing since we arrived back at the Jolly Roger, December 29th. This January has been no comparison to the January of 2014. Last year the fishing was excellent on the bay side. We were regularly getting our limit on Mangrove Snapper in the range of seventeen and eighteen inches. Not so this year and I don’t know why. The Snappers are plentiful, but we are lucky if we get one that is sixteen inches. The majority are throw backs and the ones we have been keeping are twelve to thirteen inches. John did have a nice surprise when he caught a fifteen inch Yellowtail Snapper! That is rare on the bay side. The water temperature is a little warmer this January, so I am thinking the bigger Mangroves have not moved into the bay yet. Just recently, we have been seeing great catches coming in from the Atlantic. We haven’t even tried fishing the Atlantic this year, but we sure got to thinking about it when we started seeing all the Hogfish at the cleaning station. Just had to wait for a calm enough day. I’m not fishing in the Atlantic when it is rough. It is so hard to keep your balance in a rocking and rolling boat while holding a fishing rod. Finally, calm winds were in the forecast for Sunday morning with them picking up a little in the afternoon. We decided to get an early start to take advantage of the calmness and did manage to leave the dock by eight thirty. As we left the dock, well prepare with rods, tackle, bait and ice, visions of Hogfish were swimming in my head. Hogfish must be very plentiful this year. I have never seen so many coming into the cleaning station. In the past, John has caught a Hogfish here and there, but they have eluded me. That was about to change. 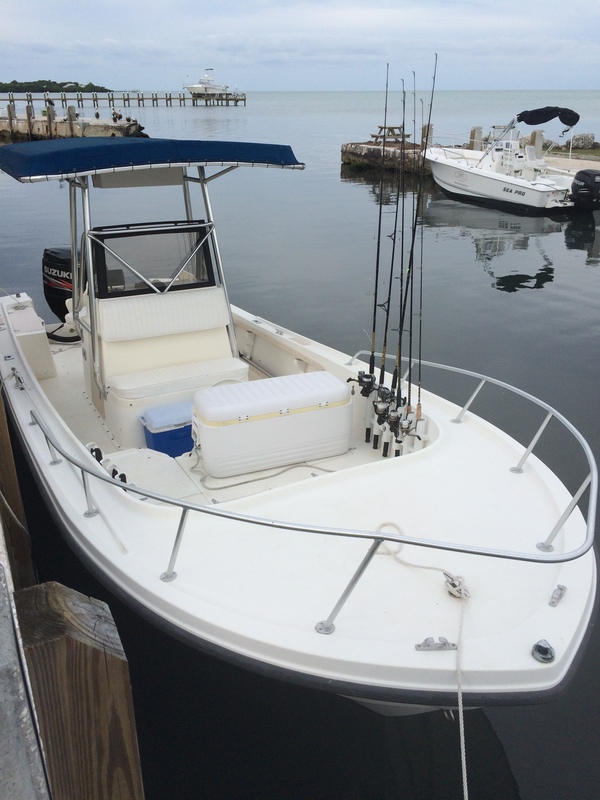 Our boat ready for a fun day of fishing. It was a fairly smooth, six-mile ride out into the Atlantic. We drifted a bit while fishing, waiting to find a good spot to anchor on. The bites started immediately, but they were Porgies and Grouper, not the much sought after Hogfish. Once we anchored, it wasn’t long before we started pulling in Hogfish. I caught my first one ever and made John stop fishing for a photo opt. He was only thirteen inches, but I was proud and he went in the cooler. Then John caught a fifteen inch one, and I thought to myself, I need one like that. Woo-hoo, was I ever excited when I pulled in my very own fifteen inch Hogfish! No more keeping the shorter ones, we were going for the big boys. We came back with eight Hogfish, just two short of our limit, and five of them were fifteen and sixteen inches. The Porgies were plentiful and they are good eating as well, so we brought back a good many of them. There is not a size or bag limit on Porgies. John also caught five decent size Yellowtails. As predicted, the winds did pick up after lunch. By two o’clock, it had gotten quite choppy and the ride home would be into the wind. The bites had greatly decrease along with the size of Hogfish, so it was time to pull anchor. I really didn’t want to wait to see the Atlantic get any rougher. Another friend of ours was fishing near by and he also pulled anchor. His boat is a little bigger, so we road in behind him, letting his boat smooth out the water for us. Otherwise, it would had been a bumpy ride for us. John had a lot of fish cleaning ahead of him. I don’t clean fish. We put up several quarts of Hogfish in the freezer and cooked some for dinner as well. So delicious! It looks like the winds will be in our favor this week. I’ll be dreaming of another fun fishing day and HOGFISH! Here is the bigger Hogfish. A pretty good days catch. The pelicans are waiting for scraps. Juvenile Brown Pelican drying his feathers in the sun. We went fishing in the Atlantic three more times. Now I have to eat my previous words about not fishing in a rough ocean. It looked to be calm enough on Monday, but once we passed under the Long Key Bridge I knew it might not be good. Three miles out it really became rough and I had thoughts of heading back. The going was slow the next three miles, but we made it out there and we decided to see how it would go. It was a cloudy day, which made it on the cool side and there was a good chance of rain in the afternoon. The boat was rocking and rolling, making it a challenge to walk around. I pretty much stayed seated. It was real slow going on catching fish. We moved around a lot trying to find where the fish were, but to no prevail. Once, the anchor became hung up and we spent at least thirty minutes trying to get it up. At one point I was in fear of the boat sinking as the back of the boat was filling up with water. John had the anchor rope tied to the transum then and was using the motor to pull the anchor up. The anchor held and started pulling the boat backwards causing water to come over the transum. I scrambled to the front of the boat with my phone ready to call my friend who was fishing near by. John got it under control, worked more on releasing the anchor and was at the point of giving up and cutting it loose, when it finally released. Whew! Glad that was over. We continued fishing, even through some light rain, catching only two Hogfish for the day. Not such a good day of fishing. The ride back wasn’t too good either. Long Key Bridge, separating the Atlantic from the Bay. The next day was super weather. Calm winds and sunny skies! It was a beautiful ride out in an almost flat Atlantic. We caught three Hogfish fairly quickly, but after that, just about nothing was biting. We couldn’t even give away our bait. It was so frustrating. Our friends did better than that, so now we are rethinking our gear. They were using lighter line and maybe that is the problem. Some people in the campground swear by smearing peanut butter on your bait. The fish love it, they say. I can understand that, I am a peanut butter addict. Just might have to try that. I will let you know how it works. Patiently waiting on a bite. Today the fishing was better, well, at least we were catching a lot of fish even if they were mostly Grunts and Porgies. I did catch two keeper Hogfish. The ocean waves were big today. We rode the six miles out to our spot only to decide it was way too rough to be out there. I suggested another Hogfish spot closer to shore thinking it would be somewhat better there. That put us about three miles off shore. The waves were still pretty big but they were goiong from the front of the boat to the back, which is better than them going from side to side. I guess I felt more comfortable being closer to shore with the bigger waves. John says I must be getting tough. Oh, I did try the peanut butter today and can not say that I saw any improvement on bites. They took my bait with or without peanut butter. Spreading it on sure made me hungry though. One plus for sure, my hands smelled yummy. Today was super amazing. I can’t even begin to describe the beauty I saw today, but the pictures will tell you. John and I went on a photo tour into three slot canyons. There were seven of us in our group plus our guide. We had two of the canyons to ourselves and spent over an hour in each one. The canyons are located just outside of Page, Arizona and on Navajo Indian land. The Navajo control who goes in the canyons. The tour company we went through is the only one that is allowed in Owl Canyon and Rattlesnake Canyon. There are other tour companies, but they can only go in Antelope Canyon. More on that later. Owl Canyon was named for the Horned Owls that nest in there. We were lucky enough to see them. I wished I had brought my bigger lens with me, but my 18-200 mm did a fairly good job. We entered the canyon by climbing down a ladder, even though the canyons are not underground. We didn’t have to do any other climbing in this canyon. Owl Canyon was different from the other canyons, as it was wider and more open at the top allowing more light in it. The other two canyons were very narrow and deep. Rattlesnake Canyon was next. I asked Kim, our guide, about the name of the canyon, if I really needed to be careful where I walked. She laughed, no, it was named that because of all the twists and turns. There was more climbing in this canyon and tight squeezes as well. And it was oh so beautiful! More so than Owl Canyon. It was so much more striated, curvy and twisty. I was amazed at each room I entered. This canyon was more inclosed at the top also, so you didn’t have a lot of bright light to deal with. A tri-pod was a must. We were working with time exposure shots that really brought out the detail and colors. I do not have much experience with that, and Kim was very helpful to me. And of course, having done this so many times, she knew just where to point the lens for the best shots. She said this was her favorite slot canyon. I understood why, I could have stayed in there all day. One last slot canyon to go, Antelope Canyon. We were excited to go there because this is the canyon where you get the beams of light. The light beam only happens certain months of the year, usually to the end of September. The beam is not as big as earlier in the summer, and there may not be one at all this time of year. When we arrived, there were so many tour vehicles there, which meant lots of people, well over a hundred. We joined up with another group from the same tour company. Their guide was Josh, and he knows everything about cameras that there is to know. He would be helping everyone to get the best shots. Not only that, he would be doing crowd control. Josh led us in, told us exactly where to stand and what to shoot at. He made sure our camera settings were correct and he kept the sand off our lens with his dust blower. All the other groups were pretty unorganized, just shooting away on automatic settings, with no direction from their guides, except to move on to another room. I’m glad I did my research before choosing a tour company. We were going to have artistic shots that would be worthy of framing. The beam of light did not appear when it was supposed to. I didn’t feel too disappointed, just lucky to have seen everything I had seen and knowing that I had some beautiful photos. Then there it was, a skinny stream of light. Guess what, everyone else had to stay back, while our group had the privilege of photographing it. The beams only lasted for a few minutes and when it started to fade, Josh took us to the other side of it. Kim, our guide, stayed to keep everyone else out. You could still see the beam from that angle, although very faintly. Josh had a shovel and started throwing sand on it. It was amazing what the sand did to the beam. Josh called them money shots, and he was right, they are worthy to be bought. Not only that, but in another room, he threw sand on one of the ledges and it flowed off like a waterfall. It made for some beautiful shots as well, and once again, nobody else was allowed in the room with us. What an experience! This is high on my list of being one of the best things I have ever done and certainly the high light of this trip. I’m wondering if the Albuquerque Balloon Festival can top this. We will see.